Pork shoulder slow cooked with fresh pineapple, bacon, garlic, and apple cider vinegar. Served over cilantro lime cauliflower “rice” and topped with fresh guacamole. Feeds a crowd and also provides amazing leftovers (see note below!). Rub the pork shoulder all over with salt and pepper. Place pork shoulder in the slow cooker. Scatter the pineapple chunks, onion, bacon, and garlic over and around the pork. Pour in the vinegar and broth. Place the lid on the slow cooker and cook until the meat easily pulls apart with a fork, about 5 – 5 1/2 hours on high or 8 hours on low. Transfer pork to a cutting board and let rest 5 minutes. Using two forks shred the meat and remove the fat. Transfer pulled pork to a platter. Spoon the pineapple pieces and some of the remaining juices left in the slow cooker over the pork shoulder. Heat a large saute pan over medium heat, add the olive oil and garlic and sauté about 3 to 4 minutes, or until garlic is soft. Increase the heat to medium-high. Add the cauliflower “rice” to the saute pan. Cook for about 5 to 7 minutes, stirring occasionally, until the cauliflower is slightly crispy on the outside but tender on the inside. Season with salt and pepper to taste. Remove from heat and place in a medium bowl; toss with fresh cilantro and fresh squeezed lime juice to taste. Scoop the avocado out of it’s peel and place in a medium bowl. Add fresh lime juice, cilantro, onion, tomato, cumin, and salt. Using a fork or potato masher, mash until a desired consistency is achieved. I like my guac a little on the chunky side so I don’t mash it too much. It you like a smoother consistency just mash it longer. Grab a plate or a bowl. Place a scoop of the cauliflower rice on your plate. Top with the pineapple pulled pork. Top the pork with a dollop of guacamole. Give it all an extra squeeze of fresh lime juice and some chopped fresh cilantro (optional). Eat. And then go back for seconds! With my leftovers, for a meal the following day, I warmed the cauliflower rice and pineapple pulled pork in a pan with a drizzle of BBQ sauce and served it in a warm corn tortilla. Tacos for the win! 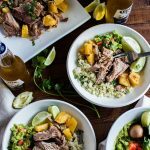 Nutritional information provided is just for the pineapple pulled pork and does not include the cauliflower “rice” or the guacamole.